Try to imagine a world without social media. Impossible, right? Whether you are hooked on sharing every last detail of your private life on one of the popular social media platforms or you are more of a laidback user who prefers watching cat videos over sharing personal posts, one thing is for sure: the global power and influence of social media is enormous. There are literally thousands of social media websites out there with new ones popping up every day. Still, only a few of them hold absolute power over the market. Based on the number of active users on Facebook, Instagram, Twitter, LinkedIn and Pinterest are the five most popular social media websites in the world. As you may have guessed, Facebook is still the leader among the social media networks. Facebook has 1.59 billion desktop users (70% of whom use the website every single day), 1.66 billion active mobile users, and a market cap of $312.78 billion. Facebook is clearly the untouchable competitor in the world of social media. Facebook is also most likely to influence potential buyers. 31% of purchasers report discovering products and services through Facebook alone. There are 4 million active advertisers on Facebook and a whopping 75% of brands use Facebook to promote their products. Instagram (owned by Facebook as of 2012) is the second most popular social media site in the world. Before Facebook’s acquisition of the globally popular photo sharing platform Instagram had only 30 million users. Today, there are over 400 million people who use Instagram to share photos and short videos. Instagram is especially loved by advertisers, estimates show that by 2017 over 70% of all companies in the US will be using Instagram to reach their target audience. With over 320 million users Twitter takes the third place in the social media race. Professional social network LinkedIn and the bookmarking platform Pinterest share the fourth place with around 100 million users each. Twitter has had a huge impact on the way we learn about the latest events, LinkedIn revolutionized the job hunting process for good, and Pinterest has played a big role in reshaping the way we search for products and shop online. It’s clear that social media sites have influenced almost every aspect of our daily lives. What is particularly incredible about the social media phenomenon is that all major platforms, including Facebook, YouTube, Instagram, Twitter, LinkedIn, and Pinterest, are less than fifteen years old! Yet, a world without social media sounds like a relic of a long gone era. 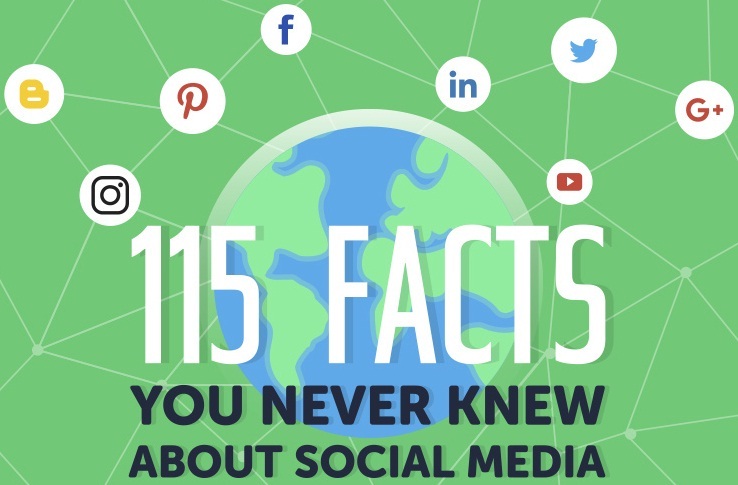 For more amazing facts about social media, feast your eyes on the stunning infographic below and learn no less than 115 new facts about your favorite social media sites! The following graphic has been developed and provided by team "Skilled.co".